To anybody that happens to actually be following my blog, let me apologise for the relative lack of posts over the last week or so. I had lots of various chores to work up around here, and there were, as is becoming usual, some health issues. My basic plan is to add one good sized post and a couple of short chatty posts per week. If anybody comments, I will reply, of course, if it seems I should. After a bit of cold weather in early January, it appears that around here we are having an extended early spring. We seem to be in a weather pattern having bright days with a high of about 40F (5 C) and a low of about 20 F (-6 C). This pattern is far different than what it used to be at this time of year. The highs are typically 40 deg F warmer than in the bad old days. And our snow cover mostly isn’t. We have scattered skiffs of crusty snow, but there is a lot of barren ground. Such a weather pattern is not good for our local vegetation – trees transpire away their moisture, but the ground remains frozen so they can’t replenish what is lost, and as a result, there is a lot of winter kill. Also our snow cover is damnably low, which will give us a drought come summer. But… I’ve got to say, even with all the negatives, I can do without the blistering cold. Now, we certainly can – and probably will – get some very cold periods before the definitive spring sets in, but the longer it stays the present version of nice, the better I will like it. With the nice weather, we have been having a herd of furry birds hanging around eating the seed I put out for birds. There is little forage for these animals, and I am quite worried about their survival. About 15 years ago, we had a yearling fawn die of starvation in one of our flower beds, and that was a really sad thing to watch. By the time she showed up in our yard she was too far gone for me to do anything except provide a quiet environment for her. And then I had to dispose of the body. She was less than half the normal weight for that time of year. So far this year, though… so good. 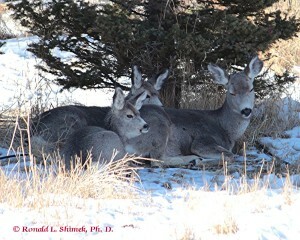 Mom naps with her two kids, last year’s fawns, all resting by evergreens in our back yard. This doe has distinctive markings, and I have photographs of her in our yard since 2002, when she was a half grown fawn. Have a good one, if you can. Today is a day to appreciate the effects the positive aspects of global warming. Back in the wasted time of my youth I remember many a January day that was blistering cold, and I am not kidding about the blistering. Windy days with actual temperatures well below zero Fahrenheit can raise blisters on unexposed skin, and the fun part is one doesn’t feel it happening as one’s skin is frostbitten (= frozen) and numb. Numb like one’s mind is numb if one has dressed so stupidly that such things can happen. It happened to me on a couple of days I thought I could get by without proper gloves. DUMB!! What REALLY hurt was that I knew better, too. After it heals and some time passes, this type of injury only hurts when it gets cold again, so that it hurts like the dickens for the next 30 to 50 or more years, every time it gets cold, just to remind one how stupid one can be. Back when I was in high school, for two years our school had double shifts each with about 1600 students while a second high school was being built in town. So, I opted for the early shift. Our classes started at 0600 hours and lasted until about noon, when the second shift started in. To get to the school on time, I had to leave home at about 0500 to walk the 2 miles (3.2 km) or so to school. Of course, I could have ridden in a school bus by leaving home at about the same time and walking about 1.5 miles (2.4 km) to the bus stop. Why bother? To sit in a cold bus with 30 other kids, most of whom I thought were idiots. Nope. To give you an idea of the temperature 59 years ago yesterday, as I mentioned in a previous post, the coldest temperature ever officially recorded in the 48 continental United States occurred about 70 miles to the west of my home town. And the way the wind blew in from the Rocky Mountains to the West… well, it surely didn’t either slow down or warm up much on the way into town. Well, those days are long gone. Today it is close to +50° F (10° C) outside right now, and the wind is almost not noticeable. In other words, it really is quite pleasant outside. And, there is nothing one could offer me to trade this warmth for the old cold. It is possible to enjoy oneself in very cold weather. It is also possible to easily die in such weather, and back in the bad old days several people per winter would perish in our area due to accidents or stupidity. One learned rules, like having a box full of winter survival gear in your car at all times. Or, probably the best one was that if the weather was nasty and one’s car got stuck, one must stay with the car, one should never even try to walk to the farm house one can see right over there. There was always the occasional death caused when somebody’s car would slide off the road, and they decided to walk about 400 m (a quarter mile) to the nearest farm house. Most of the time they’d make it, but… Every now and then the local newspaper would print a picture somebody took of a cow (this is cattle country) that had frozen to death standing up. Most ranchers would try to get their herds into some sort of shelter during the worst weather but it wasn’t always possible. Our local air National Guard unit always spent part of each winter bombing isolated cattle with bales of hay. And it worked. The middle of January it is, and it is COLD outside! We have been having a stint of weather where the low temperatures have been bouncing around -5° F (-21° C). That we have cold weather this time of year is not unusual that it is this WARM is. In the bad (good?) old days, before global climate change, the period from about 15 January to 15 February gave us our coldest weather, and it often bottomed out below -40° F, C (both the F and C scales are the same at that lovely temperature). The lowest temperature ever recorded in the lower 48 United States was –69.7°F (rounded off to –70°F) or -56.5 °C at Rogers Pass, Montana (web cam) which is about 120 miles, (193 km) from here on January 20, 1954. While it has gotten cold enough here in the last 10 to 15 years, it hasn’t been that cold, nor has it been cold for as long as it used to be. As much as I don’t like the concept – or the reality – of global warming, I have to say that warmer winters have become a blessing, particularly as I have gotten older. Continuing a discussion of a few days ago when I mentioned being a member of a dying breed, those folks who could be called “Invertebrate Zoologists”, it is obvious that I am (we all are, but I suspect I am closer to the finish line of the race than are most of the reader of this esay) getting older and since immortality is not in the cards, the obvious end point is death. So, I am dying – as we all are, it is part of living. However so, I think, is the “discipline” of “Invertebrate Zoology”. It is being killed by its own success. That is illustrated in an examination of the texts written in English. In my first Invertebrate Zoology class, the text was the 2nd edition of Invertebrate Zoology, by Robert Barnes, published in 1968, with 743 pages. Barnes updated and revised that text and after his death, two other authors took over the task. The most recent edition, the 7th, by Ruppert, Fox, and Barnes, was published in 2003, and had 1003 pages, and was very highly revised from the previous edition, and compared to the 2nd… wow!!!. Kinorhynchs, such as the individual imaged here, are invertebrates living in marine sediments eating small organisms they find there. The 7th edition was the first concentrated less on the animals’ structures, and more on the evolutionary processes leading to the those animals and their structures. The science of “Invertebrate Zoology” is really the comparative discussion of all animals, while the vertebrate chordates per se, are not discussed, there are many invertebrate chordates that are dealt with. So, this is an holistic way of examining the entire animal kingdom. When you think about this process, however, it really is an impossible task – there are just too many types of animals and more to the point, it is exceptionally difficult to put them into a cohesive comparative framework. The underlying principle of Invertebrate Zoology was that someone could learn enough of the basics about the major – and maybe some, or many of, the minor – animal groups, and could cogently discuss them in some manner. This is a valid viewpoint, but it is probably only a valid viewpoint if there isn’t very much known about each group. If there is a lot known, then the forest rapidly gets lost for the trees and generalities begin to become far too general. During the middle part of the last century, the theorizing about invertebrates, indeed, all animals, and their relationships was dominated, in the English-speaking world, by the concepts of the coelom (the secondarily derived body cavity), segmentation, and embryonic development. The bases for all of the theorization were put down in concise form in the six volume treatise, The Invertebrates, by L. H. Hyman. Probably the greatest American zoologist of all time, Libbie Hyman defended some viewpoints and theories that, at the time, seemed very reasonable. And even, if they didn’t seem right, her force of personality pretty much quashed all dissenting views. During this period, Invertebrate Zoology seemed to be flourishing, but in actuality, it was stuck in a series of ruts. Without any way to test the types of theories supported by Hyman – and, more or less – everybody else, concerning evolution or functional anatomy, the science was basically descriptive. There is nothing wrong with doing descriptive science, but it is only by hypothesis testing that science advances, and hypothesis testing was essentially impossible in Invertebrate Zoology at that time. In the latter part of the 20th century things changed and changed fast. The techniques of cladistic analysis, comparative genomic analysis, biomechanics, functional morphology, and paleobiology allowed several whole new realms of biological interpretation. As a result, it suddenly (within a period of 20 years or so) became possible to erect an evolutionary “tree” for virtually any species, and phfft….. Most of the dogma of classical “Invertebrate Zoology” was found to be …. Wrong. Not dead, as it had never really been alive, just simply wrong. The Ruppert, Fox and Barnes Invertebrate Zoology text illustrates this very well as the concepts of phylum, coelom, and so and so forth are relegated to being useful – maybe – ways of grouping animals, but they are not anything that can be used as theoretical constructions. “Invertebrate Zoology” as thought of in the 1970s, has been replaced various disciplines concentrating on testing questions of ecology, evolution, embryonic development, and animal function using invertebrates as the test organisms. However, invertebrate zoology is still relevent, and has now become more of a blanket term that describes, the general type of animals a person might be working on rather than a cohesive discipline of scientific thought. In this regard, invertebrate zoology has become a term more like physics or oceanography, sciences where the research is specialized much more on the “subdisciplines” such as astrophysics or chemical oceanography rather than on the overall category. So, as a “classically-trained” invertebrate zoologist, the scientific approach I initially learned has really died and been replaced by a much better, more dynamic and much more interesting approach. The last couple of days were chore days, so I didn’t post. Also – Hooray!!!! I got my old desktop back and it is functional. I have been spending my spare, and unsparing time, trying to restore – from backups – all some of the files that got trashed. There are some of the most ridiculous seeming problems. For example, my email program – Outlook Express – now does its “Spell Check” in French. And I can’t seem to find a way to make it remember to think in English. That is a true PITA!!! The computer tech/guru who worked on the machine really did a pretty good job, and charged a very reasonable fee. I do have backups for what was on the machine, but I am hesitant to restore a lot of files at one time, for fear that I screw up what is now, at least, a partially functional machine. I had to go to Bozeman (about a 100 mile round trip by the time all the shopping was done) yesterday. Mostly getting bird and “furry bird” food. I came back with some 400 pounds (181.2 kg) of food. And I got home, just before the blizzard struck. It is still Blizzarding… Our low this morning was -4 F (-20 C); and right now it is really nasty out 30 mph winds, with a temperature of 5 F (-14 C). The weather channel says we have “light snow”; as opposed to “dark snow”, I presume. 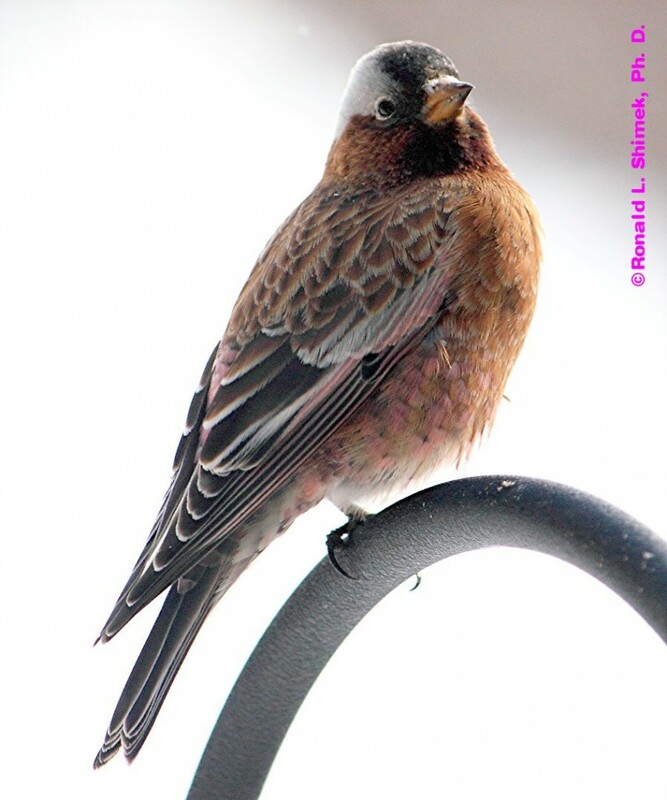 Our most abundant birds at our feeders right now are “Rosy Finches”, which are present here in a huge flock, probably close to 500 birds are around our feeders at times. The grey-crowned rosy finch, Leucosticte tephrocotis, is the most abundant one here, but the other Rosy species, or types, are also represented in small numbers. 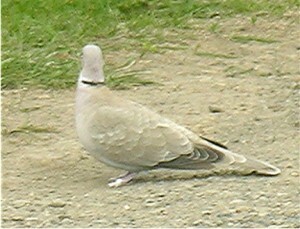 Leucosticte tephrocotis is a bird of high mountain habitats being found above the tree-line in summer. The really nasty weather found at those elevations forces the birds down to lower elevations in the late autumn. The first ones typically arrive here around the middle of November, and they leave around the middle of March. 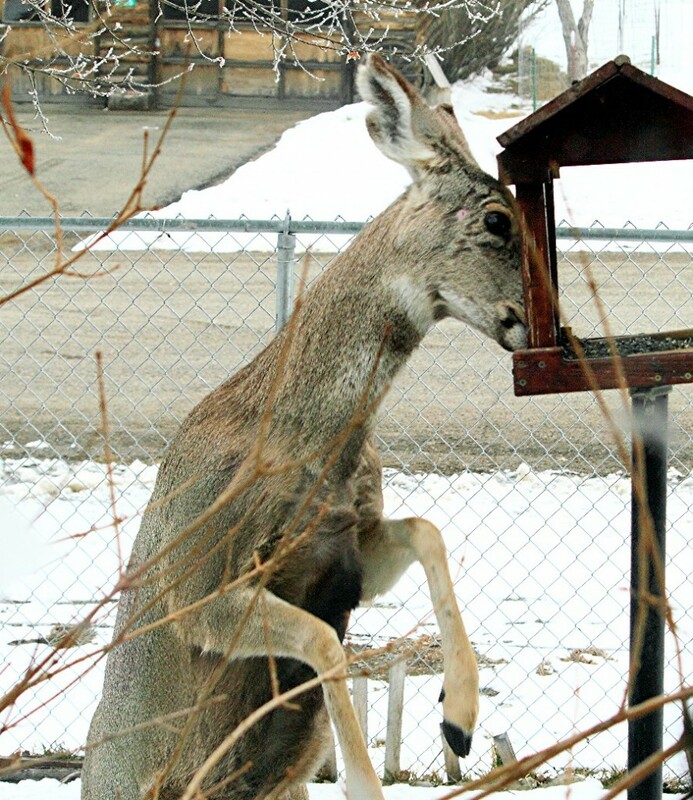 Taken in 2012, A Mule Deer Doe We Call Notch-Ear, Eating Sunflower Seeds From A Bird Feeder. My first picture of “Notch-Ear” was taken in 2002, and she is here this year, but I don’t have any images of her available yet (computer problems, remember, 🙂 ). She is here this year with a pair of fawns. Unfortunately, they, and all the other deer around here this year, are really looking awful. We had a nasty drought in the last half of summer, and that tremendously impacted deer forage. They really don’t have much to eat. So… I don’t begrudge Notch and her kiddies a few bits – or a lot – of sunflower seeds. However, it is the other 12 or so deer that have shown up at about the same time she comes by, that reallydrain the bird feeders. This was one of Notch-Ear’s fawns last February. 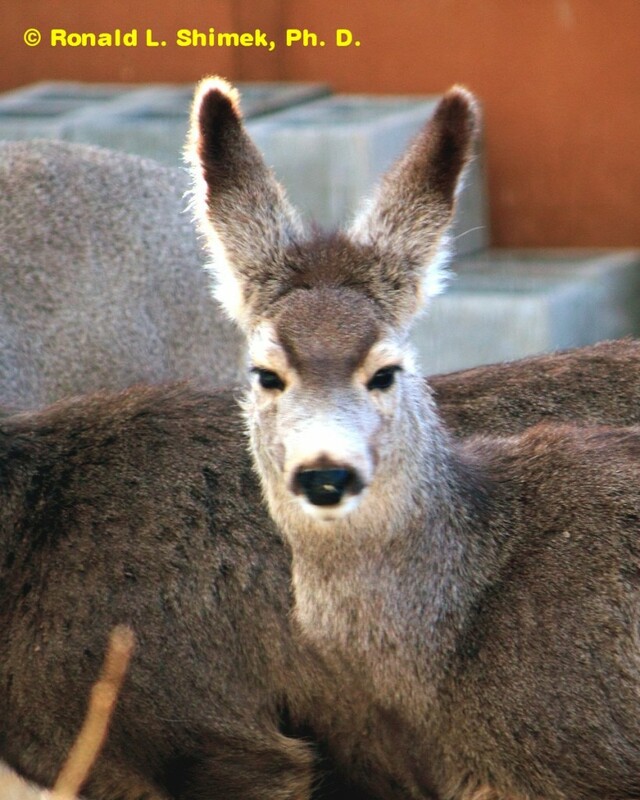 The length and shape of this species’ (Odocoileus hemionus) ears, clearly visible here, is the reason they are called “mule deer“. I haven’t had time to continue the discussion of why invertebrate zoologists are members of a “dying breed”. However, that discussion will continue in a day or two. It is more imporant to me to get my computer up and running and useful before I do much other work, such as writing. See the first videos of living giant squid in its normal habitat. OMIGAWD !!!! This short entry by Dr. Craig M. in Deep Sea News discusses this video. I suspect the real problem is that many of the folks here haven’t had the dubious pleasure of living someplace else, so they don’t know how good they have it, and because of that it is easy for them to trash it by simple neglect and the inability to see that the government has a positive role to play in the process of maintaining the region’s well-being. And – shock of shocks!!! – that the taxpayers have a responsibility to fund it. Not so for these dorks! They want the ability to trash the place, and many of them are hell bent on doing so – and regretably they are succeeding. Fortunately, at the present time, at least, the process is still a relatively slow one. With the increasing degradation caused by climate change, coupled with the inevitable population growth, the time will come soon enough when the children and grandchildren of the present folks will curse the lack of foresight of their progenitors. And because, that time will mean the absolute loss through death and destruction of a lot that I hold dear about this place, I am glad I won’t be alive to see it. Oh well, for the present, here we are, and here we will stay. Among things we simply can’t afford to move to anyplace else. The political and social environment aside, the area’s physical and biological environment is spectacularly beautiful. Wilsall is in the Shields River Valley, which is bordered on the west by the Bridger Mountains and on the East by the Crazy Mountains. The illustration below, courtesy of the remarkable software of Mr. Google et alia, shows the lay of the land pretty well. The northern end of the valley is north of Ringling, Montana, where there is a watershed divide between the Shields River and the Smith River drainages. 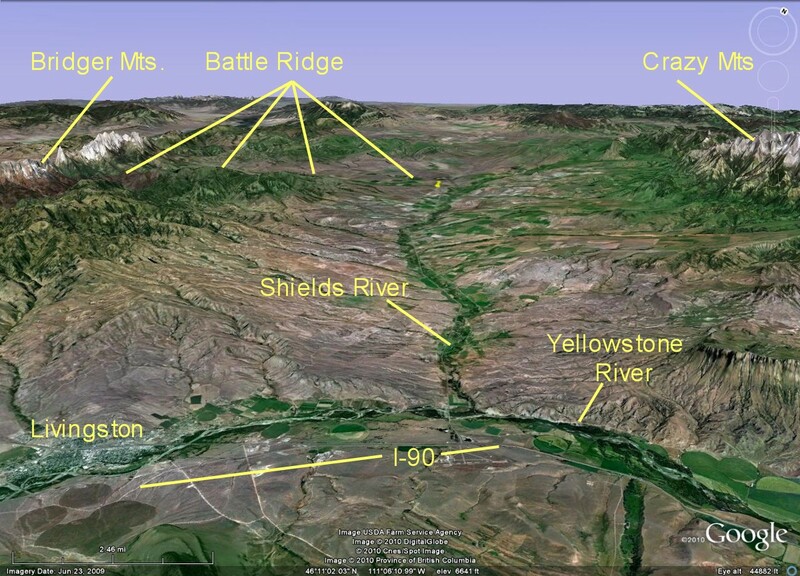 The south end of the valley terminates in the Yellowstone River valley, a few miles east of Livingston, Montana where the Shields merges with the Yellowstone. 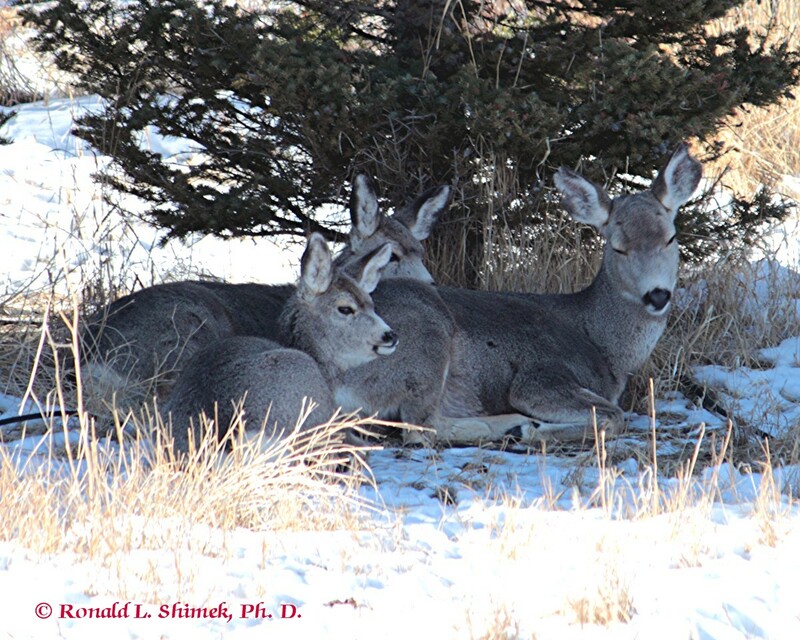 I thought I would use the next few blog entries to showcase some of the spring and early summer scenery and wild (mostly birds) life found either in our yard in the small cowtown of Wilsall, or in the nearby region. Some beautiful and interesting bird life is found in Wilsall, for at least the present. And even though the changes for the worst are relatively slow, they are accelerating and are noticeable, so … that will not be too long, at all. 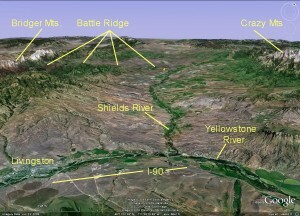 A Google map image showing the Shields Valley from south of where the Shields River empties into the Yellowstone River. Our house's location is shown by the small yellow marker. Wilsall is located at the east end of "Battle Ridge." 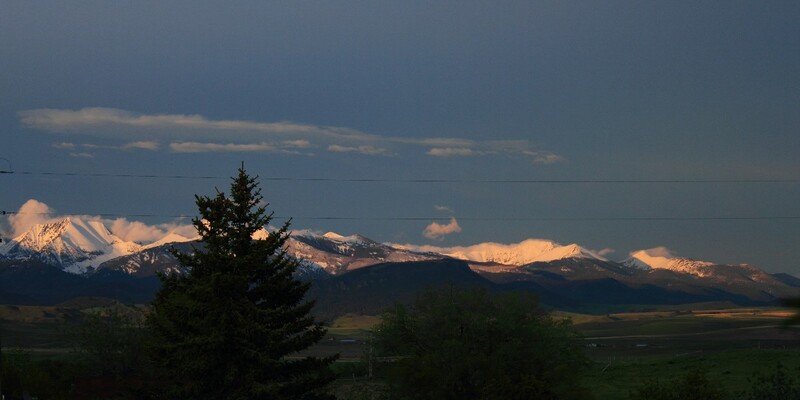 Sunset over the Crazy Mountains to the east of Wilsall, Montana. The highest peaks in this range are a skosh over 11,000 feet above sea level. 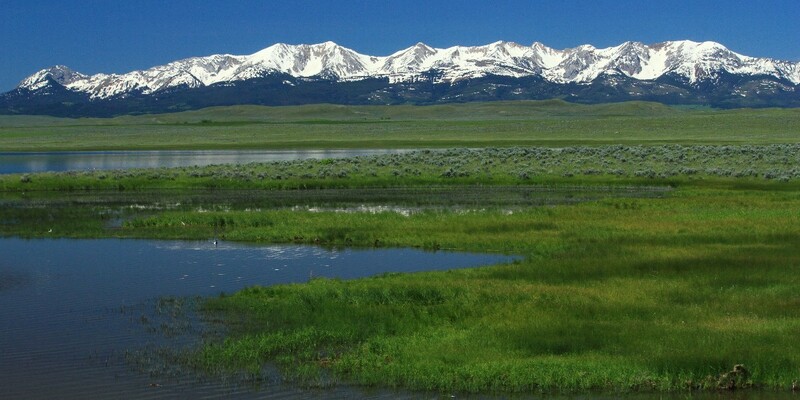 The Bridger Mountains to the west of Wilsall, as viewed from the Wilsall Reservoir a few miles north of town. As with the Crazy Mountains, the highest peaks top out at around 11,000 feet. One of my favorite Wisallian birds – for that matter one of my favorite birds at all – is the Western Tanager. Not only do they have spectacular coloration, they have neat behavior. When I grew up in Great Falls, Montana, about 150 miles north of Wilsall, I had no idea such gorgeous creatures even existed, let alone could be commonly found at times within 100 miles of my home. At the time of my youth, Great Falls was the city of small, brown sparrows. It was home to a giant population of one of the curses of the North American avifauna, the damned English sparrow. I pretty much thought that in a town, any town, about all one was likely to see were these small, nondescript or cursed ugly brown birds. My dear wife disabused me of that stupid idea, and has shown me the absolute pleasure of looking at our little flying dinosaurs, for which I am truly grateful. With that background, you probably can imagine my wonder and delight at seeing my first Western Tanager here a few years ago! I simply couldn’t believe my eyes. Wow!! I still can’t get over them. NOR DO I WANT TO!!! These lovies are here for a while in the beginning of summer. This year we appeared to have 4 pairs which were here for about a month. 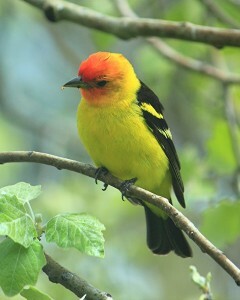 So for your viewing pleasure, in this post I have uploaded a few images of some Western Tanager males. Most folks know that there are some wonderfully descriptive names for the aggregations of some birds, probably the best known of these is, “An Exultation of Larks.” After watching the 12 pairs of Western Tanagers that were around our yard last year, we decided that a fitting descriptive name for a small aggregation of this wonderful species would have to be, “A Squabble of Tanagers.” What feisty birds!!! And how absolutely wonderful to watch their interactive behavior!!! A Western Tanager Male, in our silver poplar tree giving me an askance glance while I focused my camera on him from within my office about 20 feet from him. 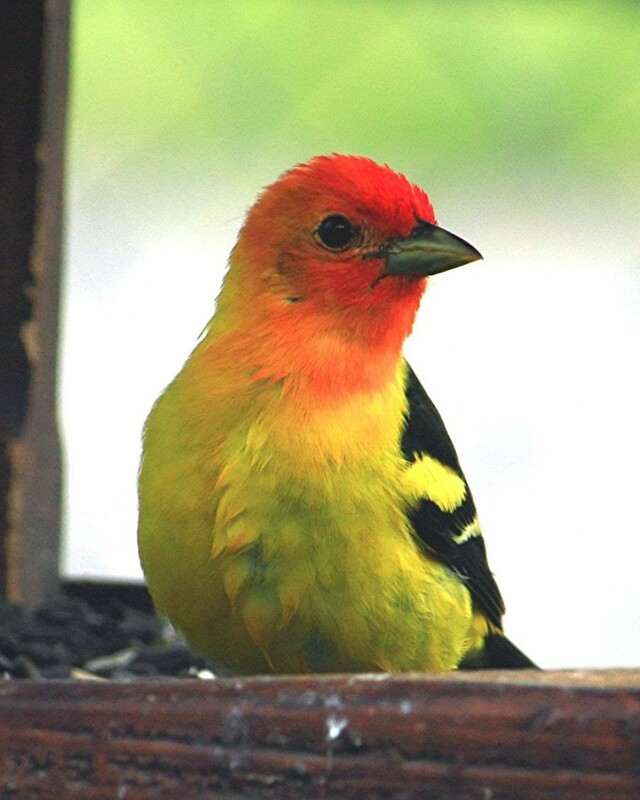 A Western Tanager Male in our "fly-through" bird feeder located about 20 feet outside my office window. I think these males KNOW how good they look! This year we had a series of males ranging from ones with almost no orange/red on the head to ones that looked like their heads had been dipped in brilliant red/orange paint. 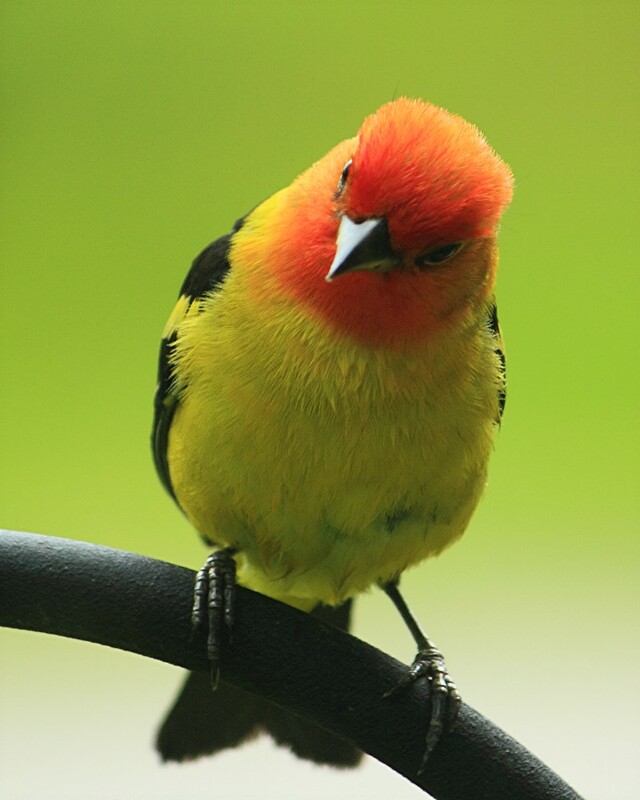 There was quite a difference in aggressiveness - and even the most "laid back" Western Tanager males are AGGRESSIVE!!! A Western Tanager male checking out some food. Unlike a lot of birds, these guys (and their gals) tend to closely examine some foods with one eye or the other before picking it up. Well, that’s it for today! More soon, there are some nice critters found around here. My wife and I got treated to quite a show yesterday. 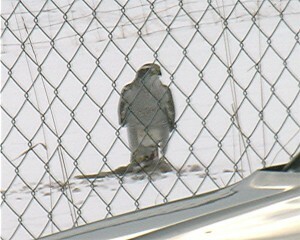 For several hours, a male prairie falcon was cruising around our yard hunting doves. 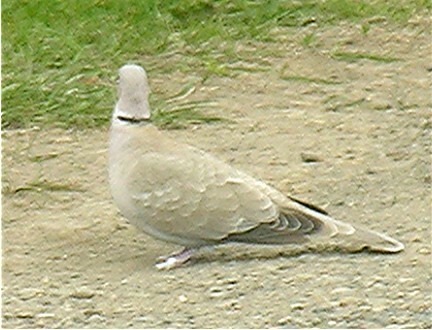 These latter birds are Eurasian collared doves, one of several introduced pest birds (think large white/gray/tan pigeons) found locally – thesea are probably descended from birds released by some non-thinking idiot who decided it would be cool to release doves symbolizing something or other at a ceremony somewhere near here. Anyway, said skyrats appeared about four years ago, and have been doing well here. Periodically, though, a truly native sky shark comes by to thin the herd a bit, and that is what happened yesterday. It was great entertainment to watch the falcon, though I doubt the doves thought so. 🙂 I saw him miss his target by inches on one pass; the dove was surprisingly agile in the air when the situation warranted! The falcon was around for a while, and then vanished. I hope he finally got dinner and settled down near by to enjoy his repast. 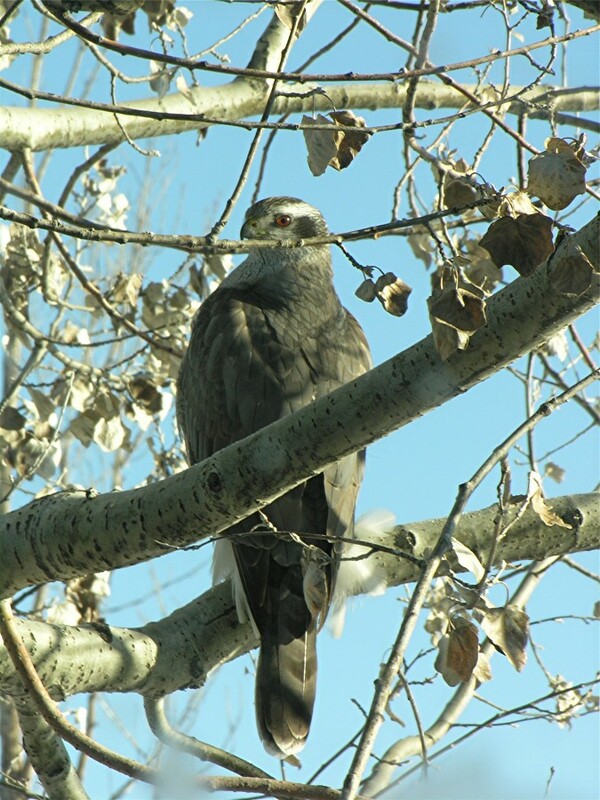 Almost exactly a year ago, we had a similar opportunity to watch a goshawk for a few days, and the second picture, below, shows the final outcome. The first picture was taken a few days before the second one, and it appeared to be the same animal. In the second image, the hawk is standing over his plucked prey that he has been eating. Sharp-shinned Hawk in the poplar outside my office window. Of such events, are the sciences of behavioral biology, or ethology, and ecology, made. And people who study these things in terrestrial environments truly lose out. I used to tell my students that one of the very neat things about being an ecologist who worked subtidally using SCUBA was that one got to see a lot more interactions than one’s terresterially-bound counterparts. If you think about it, how many times have you seen a predatory animal in nature around you (excluding those events caused by humanity or human pets ) actually kill and eat a prey organism? I would wager that the total sum of those events witnessed by anybody is pretty small; I know it is with me, and I look for them. It is possible to calculate some sort estimat of the odds of seeing such an interaction at any given moment. For example, if a person is 35 years old, that person has been alive about 1 billion seconds. If each second is a discrete a moment of observation, the rough, back-of-the-envelope odds of having seen such an event through that person’s lifetime are easy to work out. First, assume that about of the third of the time has been spent sleeping, so subtract a third of the billion away, phffftt!, and now there 667,000,000 million potential moments of observations. Then assume that for the first third of the persons’s life she or he was effectively unaware of the world (childhood, teen-aged years, and so forth), so subtract a third of the previous remains and now there about 444,700,000 million potential observational moments. Now, drop out a another third for meals, and other daily mindless activities, and now there about 296,400,000 million observational times. Being generous, let’s say our victim subject was outside observing nature 1/10 of each day (and I think that will be a vast over estimate for most folks, but, what the hey, let’s go with it), so now there are 29,640,000 potential moments of observation. And if that person witnessed 10 natural events wherein one animal killed and ate another (and I suspect that would an overestimate), that means our subject’s odds of seeing such an event were 10 in 29,640,000, or 1/2,964,000, or (very roughly) 0.0000003. Pretty slim odds (!) of seeing some interesting natural event such as predation. Back to my point about working underwater in the marine world, I could see animals kill and eat other animals many times during a hour’s dive, and often did so. 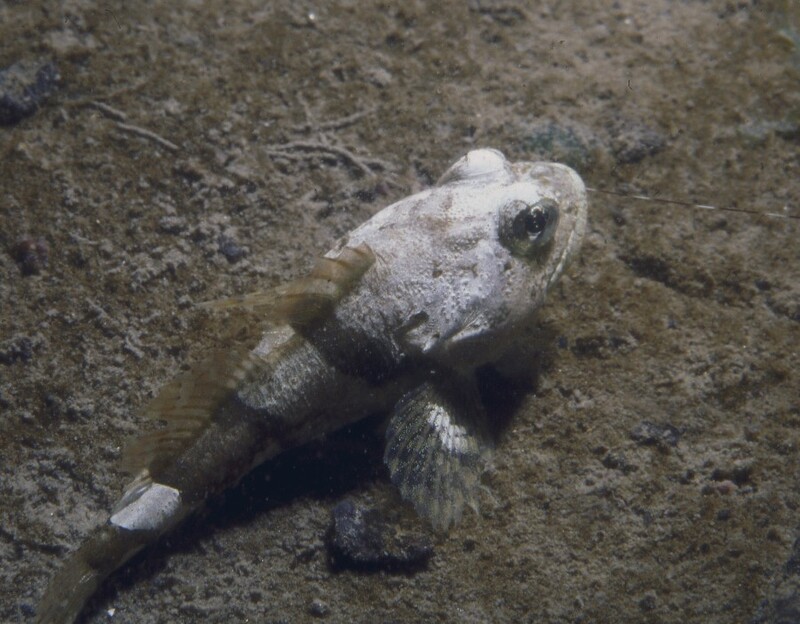 Below are a couple of images recording some of those times (and be sure to click on the sculpin image to see the shrimp’s antenna). Obviously, the moral of the story, of course, is that one must dive to really observe and understand nature. 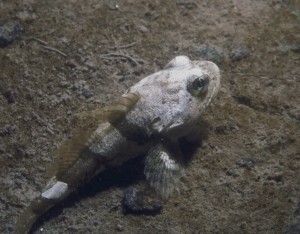 A Buffalo Sculpin, Enophrys bison, that has just eaten a shrimp, note the antenna visible protruding from the mouth. 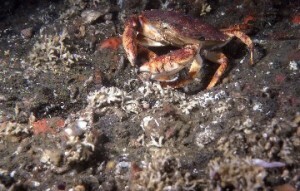 A red rock crab, Cancer productus, eating a scallop. But the point that visible large animal to animal interactions are more evident in the marine environment is, I think, a valid one. Thinking about the point made above, and making a not-so-tortuous connection to marine aquaria, those boxes of water full of critters may be (depending, of course, on how the boxes are set up, and what’s in them) quite reasonable analogues to a natural environment. And that means, any aquarist with such a tank should expect to see predatory (and other “natural” ecological or behavioral) events occurring with some reasonable frequency in their systems. And, of course, all of us aquarists (or at least of us who observe our systems) do see these events. Everytime we feed some live animal to our livestock, we see predation, albeit those are staged events, but with suspension-feeding animals, corals for example, within the staged event, the actual feeding behavior on the part of the coral, is likely essentially the same as when the “real thing” occurs in nature. But even if those “wo/man-made” events are factored out, all aquarists have seen unintened predation occur in our systems, and sometimes rather frequently, as when when a newly-observed acoel flatworm on the aquarium wall is seen to capture and eat a copepod. In fact, by observing some of these types of events any aquarist worth their artificial (sea)-salt can – for some animals, at least – see interactions that have never been seen in nature, and depending on the interaction – such as with the flatworm and copepod example – such events may be exactly what occurs in the real world, or a mimic so close that the difference is immaterial. So, folks, on this cold winter, while the snow outside blankets the northern hemisphere, those of you with coral reef aquaria kick back and relax and enjoy the tropical world in your living room. It’s a world of your making and if you have done your job, properly, it is a VERY real world. For the rest of you, it is time to shovel snow!